This week I’m on the East Coast and I had the pleasure of working with a group of innovative librarians and early childhood experts who all care about kids and supporting their families’ literacy needs. The league of media mentors just got bigger! Here is the Little eLit post about our collaboration. This was a week of collaboration. Librarians and early childhood education experts teamed up in Harford County, Maryland, to talk with more than 80 librarians and educators as part of a grant from Comcast to expand the Harford County Public Library system’s digital literacy efforts. 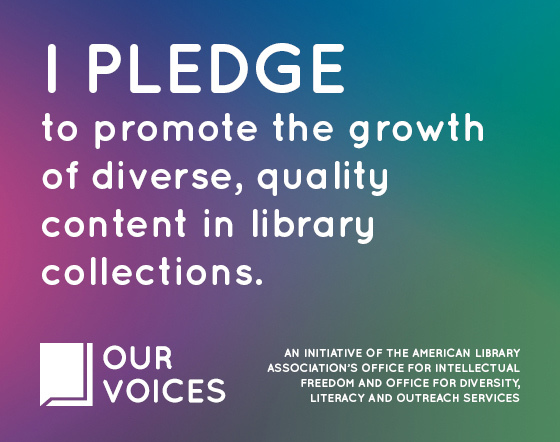 We had two goals: to talk about what’s new and what’s still true in the world of new media and young children, and to train librarians in their evolving role as media mentors. The successful training included Tanya Smith from the Fred Rogers Center for Early Learning and Children’s Media, Dorothy Stoltz and Kristen Bodvin from the Carroll County Public Library (Maryland), and myself, Claudia Haines, from the Homer Public Library (Alaska). Over the last year, many of us involved with Little eLit have been working on a book called Young Children, New Media, and Libraries: A Guide for Incorporating New Media into Library Collections, Services, and Programs for Families and Children Ages 0-5. It’s not just a book, but a thoroughly researched tool for librarians who are becoming media mentors, supporting families and fostering literacy with a variety of media. Each month a new chapter is being released online and once all of the chapters have been released they will be compiled in a pdf document. This month the chapter Evaluating New Media, written by myself and Carisa Kluver of Digital Storytime and the The Digital Media Diet, has been released. We hope it will be useful for both those using new media for the first time and seasoned new media users alike. Check out the book and let us know what you think! I’m blogging at Little eLit this week about our 4th Annual LEGO Contest and Maker Monday: LEGO, a program for young builders during which we filmed short, stop motion films using the LEGO Movie Maker app. As promised, here are some of my new favorite apps that tie in nicely with our summer reading program this year. I have another list of iOS favorites you might want to check out here. You should also check out Little eLit Pinterest app boards or Digital Storytime for more ideas. To find out how I evaluate apps and new media for use with kids, read more about my criteria. Know of any apps that should go on this list? Let me know! 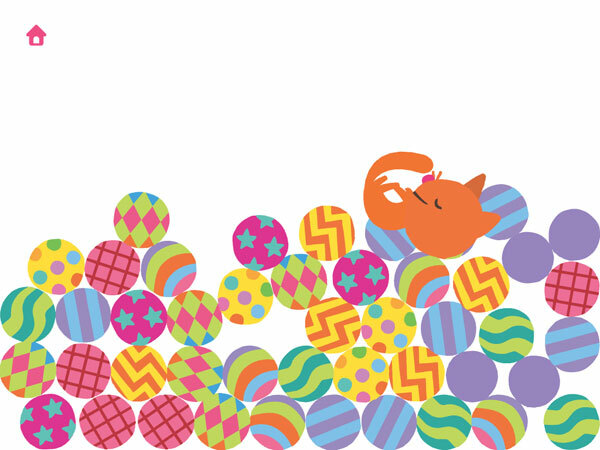 As part of the summer series of Family Storytimes, we explored sounds and music this week. I was actually giddy as I set up! It wasn’t because we had a guest who regularly reads, plays guitar and sings, but that was great. It wasn’t because of the fun books he read, but those worked well. 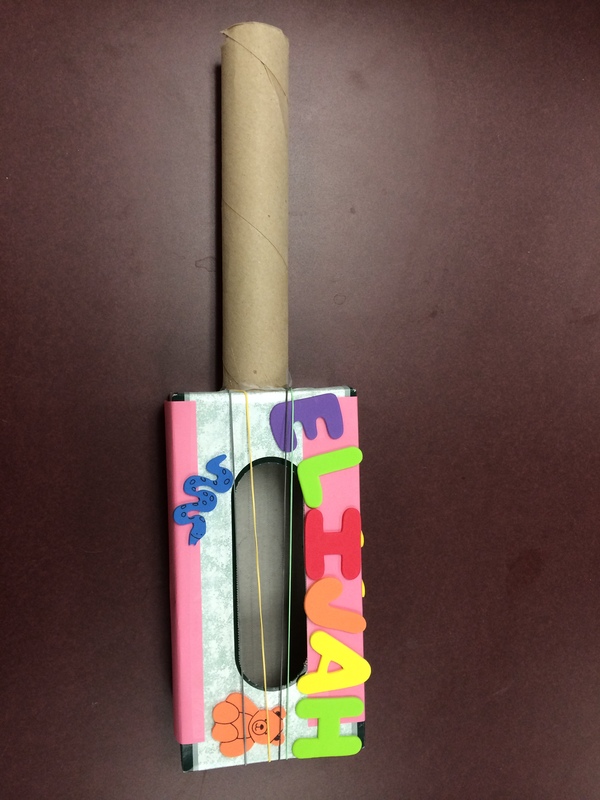 It wasn’t because of the cute tissue box guitars we were going to make, but they were a hit. It was because I was going to blow the minds of preschoolers with the Makey Makey! For the first half of storytime, our guest played music, sang and read stories related to sound and music with families. Whenever he comes to storytime, he reads and I pick the books, plan the theme, and take care of the second half of storytime. I usually pick out the books for him because I plan the storytime themes before I know when he’ll be reading. (It also helps to have a plan if he’s sick or can’t make it for another reason at the last minute.) He’s an excellent addition to storytime and has been joining us every six weeks or so for years. We talk often about how storytime went and change what we need to. This week I created four activity stations. The only way I can do this is employing the talents of a summer teen volunteer who is quickly settling into the busy storytime routine. I can have her run one station while I run another. The other two stations were either independent stations that have directions for caregivers or require only minimal help and I can assist from a nearby station. You’ll find examples of this craft all over the internet, but Instructables has step-by-step instructions if you need help. I had cupboards full of donated tissue boxes and paper towel tubes that were perfect for this craft, so start gathering! Before storytime, I went through the collection of rectangular boxes and made sure they had holes only in the bellies. (Some boxes have holes that run from the center around one side and obviously don’t work for this project.) I also made sure the plastic was removed from the hole. Caregivers and kids selected a tissue box, drew the outline of the paper towel tube on one of the short ends of the tissue box, cut out the hole (slightly smaller than drawn to create a tight fit), glued the tube if necessary, attached rubber bands, decorated and then played the new instrument. I have a small collection of individual, kid-friendly musical instruments that I placed in a basket for families to explore. Some musicians played together while others made their own music. I encouraged caregivers to ask questions of their young musician, observing what kind of sound each instrument made, how the sound could be changed, and if it was loud or soft. I printed out several music-related coloring sheets and placed them at a table with markers and crayons. This helped ease the crowds at the other stations. I regularly use new media in storytime and programs for kids of all ages, but I was especially excited to introduce everyone to the Makey Makey at storytime. I first heard about the Makey Makey from Stephen Tafoya in a discussion on the Little eLit listserv and knew I had to get one. I bought one and played with it at home with my two kids before bringing it to storytime. The basic idea is this. 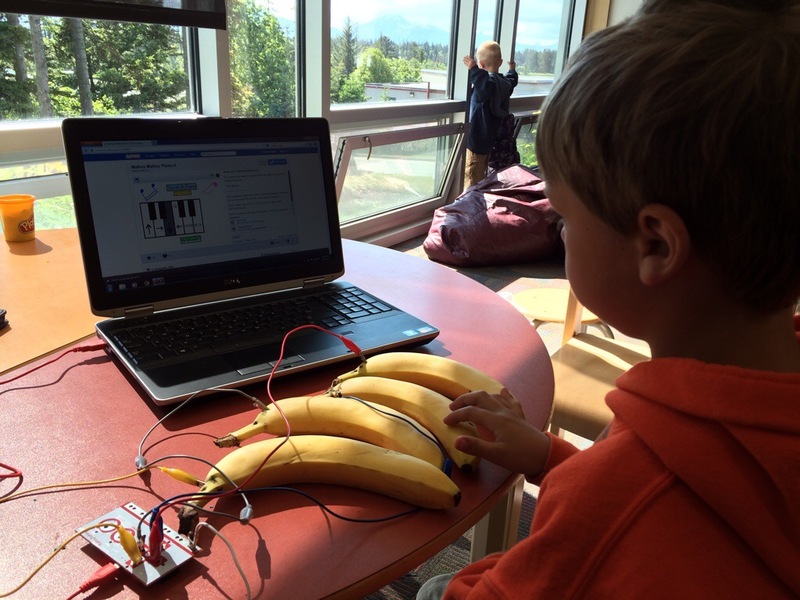 The Makey Makey is an invention kit that fools a computer into thinking its a keyboard, thus allowing you to turn almost anything into something that can create sound, type text, be used to play a game, or create an image. I love the Makey Makey for several reasons. It gets kids (or teens or adults) creating while using digital technology in addition to consuming it. It makes some ho-hum digital content more dynamic and gets kids and adults playing and talking together, encouraging joint media engagement. Using it warrants basic scientific questions. What happens if you do this? How does this work? Why did it stop working? It allows kids and parents to learn about the big concept of electricity in a kid-friendly, hands-on way. It introduces parents to Arduino, an open source platform for manipulating electronics in cool ways that artists, designers, and hobbyists can work with to make great things. It seems like magic, but isn’t! I believe that if kids realize they can make music with play dough or bananas, they can do anything! I set up a laptop and the Makey Makey at a table with enough space for several kids and adults to experiment together. I also had four bananas and four containers of different colored play dough. On the laptop, I had the Makey Makey Piano-2 site ready to go. This provided a visual keyboard on the screen so kids could see and hear what happened when they touched the banana or blob of play dough. I did a quick demo of how the tool worked and gave a brief explanation of electricity. For many kids and adults, this alone was mind bending. (I have to admit I learned a few things about electricity preparing for this storytime.) The best part, though, is that each time a child sat in the player’s chair, we talked about how electricity works and demonstrated how it works at the same time. Several three year olds got it and applied their new knowledge as they manipulated the new toy. It was amazing. Caregivers were b-l-o-w-n away. You just have to make that happen at storytime sometimes. 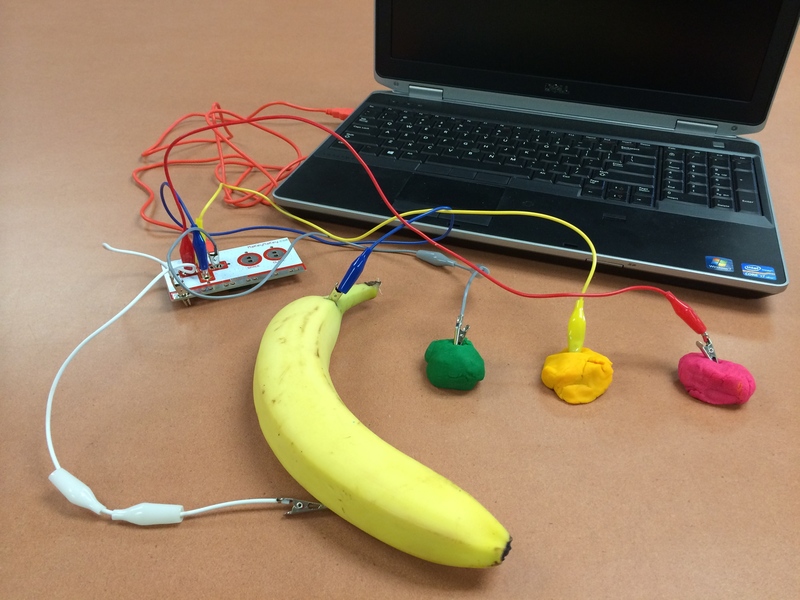 As each child took their turn controlling the Makey Makey, I asked them if they wanted to use play dough or bananas to make music. Once they chose, I showed them how the tool worked and hooked up the alligator clips (either by sticking each of the four clips into a different blob of play dough or clipping them to the end of four different bananas). I showed them how they had to hold the ground/Earth/negative clip in one hand and then, with the other hand, tap one of the four “keys” they created. I gave each child enough time to understand all of the pieces involved which was key (no pun intended). Every child was patient as they waited for their turn, which blew my mind. At the table, I also had an iPad with Sago’s Mini Sound Box app loaded on it. I wanted to offer another way to make digital music and sound through touch and provide a second option for play while kids waited for the Makey Makey. The app, a nice choice for toddlers and preschoolers, gets kids making music and sound by tapping, shaking, and moving the iPad and the images on the screen. I really like the fact that this open-ended app employs multi-touch so kids or kids and adults can play together. I engaged the device’s Guide Access feature so I wouldn’t have to worry about kids leaving the app accidentally while I was using the Makey Makey. A few kids explored the app and a couple of parents asked about it, but most kids weren’t particularly interested.